We’re back with another great Spectacular Summer Blog Hop post! I really hope you enjoyed last week’s Canada Day BBQ inspiration and Canada Day wreath posts! 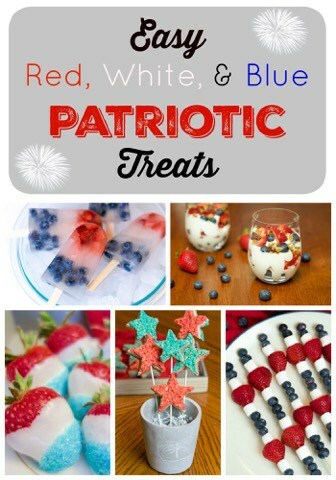 Today I have a sneak peek into a little something for my readers south of the border: a delicious round-up of patriotic Fourth of July treats, courtesy of Health, Home and Heart. This round-up of red, white, and blue treats (like chocolate-dipped strawberries and homemade popsicles) gives me some ideas that I could use for Canada Day this weekend. All I have to do is take out the blue and add some extra red or white. I mean, who is really going to complain about some extra strawberries, watermelon, or raspberries?? No one. One of my favourite parts of this summer-long blog hop is that I get to know my fellow bloggers through some neat trivia. It really puts a human being behind the content – know what I mean? Here’s a little about today’s blogger, Amy of Health, Heart and Home. Thy Will Be Done by Hillary Scott. I know this is pretty cliche, but my daughter is my proudest accomplishment. She’s only two right now, so I haven’t had enough time to completely screw her up yet. Ha! Seriously, though, she is such a great kid and truly amazes me every day. Isn’t that just the perfect answer? I completely agree with Amy: my proudest accomplishment is being a wife and mother to Erick and Katherine. Yes, I’m proud of my professional and musical accomplishments, but what we truly leave behind is the legacy of our family. Amy sounds like someone who’s got her priorities in order! Be sure to check out all the other #SpectacularSummerBlogHop Posts!